Awww, has ceelo dropped out? BOOM - Erykah Badu is one of the all time best ever!! One ticket for sale $130 - will deliver in Brisbane. Saving of around $25..
Big up the dub mariners!!! Bro luda had me until the calab of the year with Justine beaver! Fucken sell out! Haha. Yeh, most of that last album was dreadful. Once he come this far never really expected him not to sell out tho, Its Luda. If you haven't got your tickets yet, you can get them for ½ price up until midnight Friday 11/02/2011. The deal is available for the Melbourne and Sydney events. Just click on Change city to buy the Melbourne one. There is definitely something to be said for alfresco festival settings held on a Sydney summer day in Centennial Park. Yesterday it was raining (not heavily) and cool which to be honest mi prefer than heat! Got deh bout 4:30 with a group of friends watched Erykah Badu from de back of de 'Roots Tent'. Then after mi little friend Samrai did mash up de place in his turntabilist party style Fat Freddys Flop did come on.. Seriously is it just me or are they on demsleves? Kept mentioning how dem originators, de only thing dem originate is being de beacon fe annoying New Zealanders who feel sey dem kno reggae cah of dem fuckery music. Fat Freddys need fe seriously go wey. Anyway mi friends invariably had dropped some acid at de beginning of de set and started saying how dem couldn't handle Fat Freddy no more so we went to de tent where Sasha was djing. Well mi did leave mi friends in deh after bout five minutes. Went back to de Roots tent met up with a next friend an waited up de front for Gong an Nas. De band was tight and de show dat dem did was nothing more or less than mi did expect. Nas is definitely Gongs Robin fi im Batman. Still don't feel dem sound like dem compliment each other. Mi friend mi watched it with felt dem do.. Left after dat mi next friend went to watch Faithless wid other friends. Seriously is Australia de dumping ground fe has beens? Gong is de only really international contemporary artist dat is current pon dat bill... Big up Ranking! Damian Marley is friggin hot!!! De band was tight and de show dat dem did was nothing more or less than mi did expect. Nas is definitely Gongs Robin fi im Batman. Still don't feel dem sound like dem compliment each other. 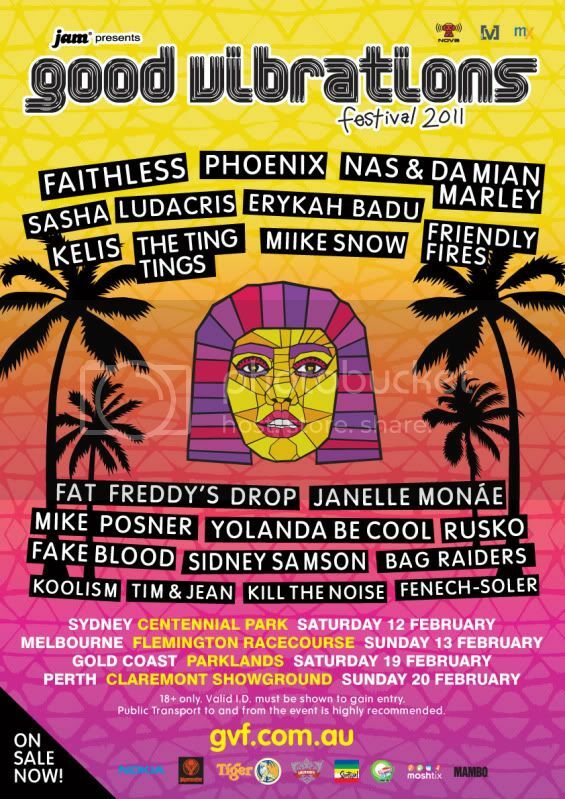 I agree with you here - it totally came across as the Jnr Gong show featuring Nas. The entire band was Junior Gongs (the percussionists looks scarily like Freddie McGregor), and I felt Gong's delivery and performance way outshone Nas'. I was happy when Nas left the stage for a break (he was annoying me), leaving Gong perform tunes outside of the combination album. I was surprised at how much I enjoyed it. First class performer.